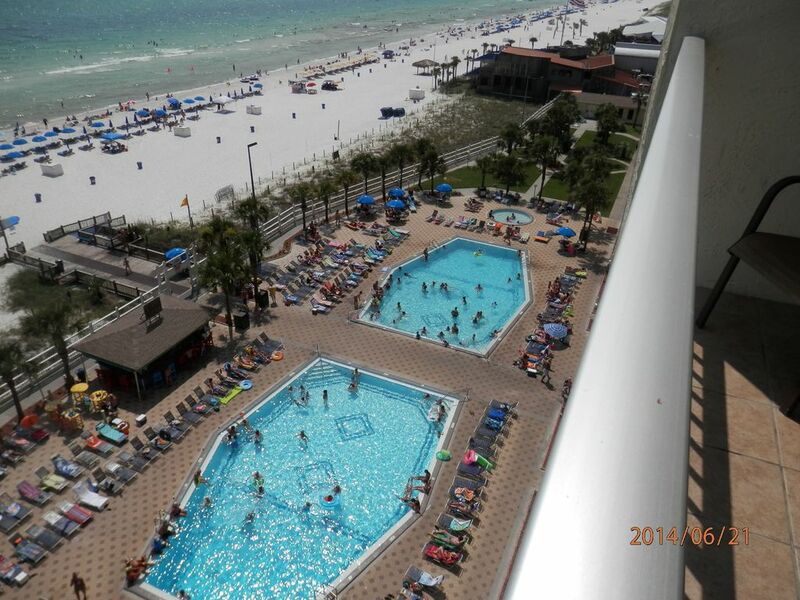 Great Gulf-Front Condominium with all the luxuries of home! These Gulf-Front Condominiums have a beautiful beach front view of the Sugar White Beaches. Panama City World's Most Beautiful Beaches. 21 years for Spring Breakers. This Unit is located in the heart of the beaches on Thomas Drive easy access at The Summit Resort. The complex features two large, Olympic-size pools of which one is heated, two children's pools, two outdoor hot tubs, and indoor spa. Also available Snack Bar, Tiki Bar, tennis, his/her exercise rooms with saunas, a game room, and many extras. This unit is located directly over pool on the 10th floor. Bedroom has a King size bed, 2 singles in the bunk area and a queen size sleeper in the livingroom. The balcony overlooks the Gulf and the pools. The unit has tile floors, new wood floors and fresh paint in bedroom. 'Please remember to bring your own beach towels, the bath towels are not for use by the pool or beach!' Absolutely no smoking in the unit. Summer bookings are available for Sat to Sat . No mid week ,weekly bookings, except for last minute if available. Call for more details. The Summit is a gated complex with 24 hour security. You may enter complex from both street side and beaches. I am a Real Estate Broker (Top Producers Real Estate Center) my office is located just 1.5 miles from the Summit. Selling the Beaches for over 25 years. Buy with confidence and Sell with Success. I've been a resident of the Beach for over 46 years. I enjoy most outdoor activity on the beach as well as snow skiing. Gulf Front Tiki Bar and beach playground for the kids. Onsite food. There is 2 dressing areas , one has a toilet and sink area and the other has sink, then you have a separate room with tub and additional toilet. 3 people can be getting ready in separate areas at the same time. No towel exchange, private unit. All towels accounted for. Ice maker no operating, ice trays available. Water Park, Walmart, Pier Park, Ripley's, Go Carts, Putt Putt Golf.